I've decided Saturdays are now Giveaway Saturdays on Book Cracker Caroline. I will be posting a giveaway every Saturday. 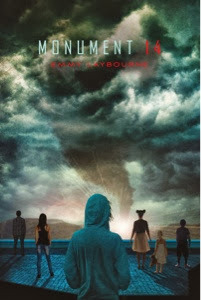 This week's giveaway is for a paperback copy of Emmy Laybourne's Monument 14. To me, tornado is the scariest. I was living in a mobile home park when I was younger and one hit the side of our trailer. Terrifying.